Inkstand by Kakimori is a small fountain pen ink store in the Kuramae neighborhood of Tokyo, where you can custom-mix ink colors. I wrote about Kakimori, the parent shop of Inkstand, in this post if you’d like to read about it first. Mr. Three Staples and I didn’t take many pictures inside the store at Inkstand because we were both preoccupied with ink mixing. I’m making it up with plenty of pictures of inks bottles we made, but as in the Kakimori post, I’ll mostly talk about our custom ink making process and the overall shopping experience. This post will not be a review of the inks themselves. Side note on the shop name: I’m not completely sure if their official name is Inkstand or Ink Stand. I’ve seen examples of both, especially over at Kakimori’s website, but I’ll go with what Inkstand's website uses. Inkstand is located right next to Kakimori. It went through a brief hiatus last year but reopened in late 2016 with a new set of inks. We happened to be in Tokyo right after it reopened (thanks to Cindy for the heads up), and made a reservation (required) for a weekday afternoon. I should mention right here that the inks they now use are pigment-based, not dye-based, which means they’re more water-resistant but can potentially clog up your pens if you’re not careful. Before the shop renewal, they used Private Reserve inks, but currently their inks are from Turner, a Japanese paint company. Inside, Inkstand is a fairly small, straightforward space. You’ll see a long counter along the right side, and behind it is where the shop assistants will prepare your custom ink. Overall the shop felt airier and more modern-looking than Kakimori. You could say it had a laboratory vibe, with a shiny white counter and lots of glass bottles and beakers. Not to mention glass vials lined up along the right wall. The tall counter is where you work on your ink formulas standing up. Mr. Three Staples and I were the only customers during our reservation; I don’t recall exactly but I think the counter had space for 3–4 people. Later a group of tourists walked in but they were politely turned away. On the counter was everything we needed to create our custom inks, or “order inks” as they call them. Each person’s workstation had: a set of base color inks in dropper bottles, a pad of paper, a glass dip pen, a glass rod for stirring, a stack of tiny plastic cups for mixing, a large beaker filled with water for rinsing, some napkins, a laminated color chart, and of course instructions. Basically, you create your own blend by determining the ratio of base colors that produces the color you desire. You do that by dispensing base colors, drop by drop, into the small plastic cup, mixing well with the glass rod, and then testing the result on the pad of paper with the glass dip pen. Your formula can can include up to 3 base colors (each bottle is labeled with the color name in English). The color chart shows you 1:1 combination of all 14 base colors, so you can decide which colors to mix first as a starting point. As you experiment, don’t forget to keep track of the number of drops you use of each base color in your mixture! This “recipe” is what you’ll eventually give to the Inkstand assistant to produce your custom ink. Also make sure to clean the mixing rod and the dip pen thoroughly in the water beaker and wipe them dry with napkins between different mixes. I remember the guy who was in charge of helping me gave me a small intro talk, probably with tips and warnings, but I can’t recall what he said. I may or may not have been pretending I knew what he was saying, which was all in Japanese. Plus he wasn’t very friendly. Not rude, just very disinterested. After the intro, we were pretty much left to our own devices. No hand holding at all, which we preferred anyway. The reservation was for 1 hour but we were told to decide on our formulas within 45 minutes. Apparently, it was plenty of time for Mr. Three Staples because he made two colors, while I just made one. This was probably due to my indecisiveness and timidness. The color chart helped a lot but it just took me a while to warm up to the technique. Let’s just say I used up all the little plastic cups that were given. Another thing that helped me: my own gel pen. I used it to jot down changes to the ratio and new base colors I introduced to the mix I was working on. I could’ve done that with the glass dip pen but it was far less distracting and faster with a separate pen. Once we finalized our “recipes” and notified our respective assistants, they made swatches using our ratios and had us confirm the colors. After that, they had us write our names on our order sheets, and told us to come back in 30 minutes (40 minutes for 2 bottles). I believe the limit is 2 bottles per person. So off we went and walked around the quiet neighborhood. More on this at the bottom of this post. A selection of pre-formulated inks. I believe they were available for purchase. When we came back, our inks were all ready for payment at the register. It was ￥2160 per bottle, containing about 33 ml (about 1.1 oz), but these days, it’s ￥2500, about $23 USD at the current exchange rate. We got lucky with their special shop-reopening deal. Pricey for a small bottle but not unreasonable for a custom color and the unique experience. I also picked up one of their Kakimori-branded rollerball pens at the last minute, which are designed to work with fountain pen inks. Again, a little more about this pen towards the bottom of this post if you’re interested. Overall, it was a very cool experience! Slightly intimidating and stressful but I’m happy with all three colors we made. Thankfully, they turned out to be unique in our small ink collection. I didn’t realize they were pigment-based until after the trip, but that hasn’t stopped me from enjoying them; I was going to try pigment inks at some point anyway. Now that I know, I’m learning more about them and being extra careful not to let them dry in my pens. Each bottle comes in a minimal, black paper box with cut-outs on 2 sides. Inside is a little “how to use” info card and custom color recipe card that has your ink serial number you can use to reorder the ink. Just like Kakimori, I wish Inkstand was in my neighborhood, so I could pop in whenever I have extra cash to burn (ha!) and create new colors. Perhaps it’s a good thing it’s on the other side of the globe? Another cool thing that make me wish I were a local is that you can order refills of your custom inks (possible online; no reservation needed). Your custom ink comes packaged with a “serial number” that you can use to reorder the ink. This service would be definitely something I would take advantage of if I lived there. (Note that if you made custom inks before their hiatus last year, they no longer source the same inks and you can’t reorder them anymore). Well, if we ever empty our bottles and have another chance to go to Tokyo, we’ll be sure to have our ink numbers handy. Mine is on the far left; the other two are M’s creations. I really like them all. I tried to make a color similar to, yet different from, my favorite J. Herbin’s Cacao du Brésil. I think I was successful. See 3rd from the bottom row. And we’d check out this new set of Kakimori mix colors that they just introduced last month. These colors are made with the same pigment-based inks used at Inkstand, but obviously they’re their own custom blends and priced lower than custom inks. Such dreamy names, too. Perhaps they’d be good for those who don’t have the time to make a custom color but want something unique to take home? If you’re planning to go, I hope this post was helpful. Be sure to check the Inkstand website, even if you don’t know Japanese, and familiarize yourself with plenty of pictures. This is the rollerball that I added to our order at Inkstand. Its tip size is 0.7 mm, and it was ￥1728 (about $15.50 USD these days). I don’t write with rollerballs on a regular basis, with such a thick tip no less, but it was unique to the store and the price seemed reasonable for a souvenir item. This is just a quick look, in case you’re planning to shop at either Inkstand or Kakimori. It’s a pretty chunky pen, by my standards, with clear plastic body and silver finishes at clip and finials. The top of the cap indicates that the pen is made in Germany and it comes with a Schmidt converter inside. Nice looking overall but I find its performance just okay so far. The whole construction feels a little “squeaky”, in sound and feel, for lack of a better word. The ink flow is good but the feedback you get seems quite sensitive to the angle at which you apply the tip to the paper, too. The rollerball must be pretty popular because they also came out with the 0.5 mm version, and both sizes sold out recently (restock coming soon in April, with 3 pens per customer limit). Perhaps it’s a testament to how popular Inkstand and Kakimori are. They also promote the pen quite a bit, with several samples of it throughout both stores. They do stress that since their inks are pigment-based: if you load the rollerball with their ink, you shouldn’t let the ink dry in the pen, and it needs to be used at least once a day. 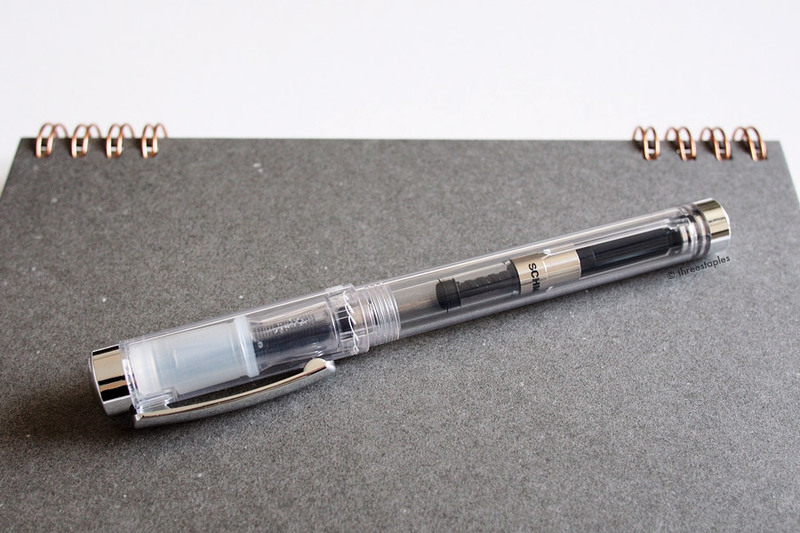 It's also recommended that you refill the pen with the same ink because it’s difficult to clean it out completely. Maybe there are many people who buy several of these pens for this reason? Anyway, I can tell you that I tried it with one of the Inkstand inks, and it took a long time for me to clean it out. Now it’s loaded with a dye-based fountain pen ink. Anyway, the jury’s still out whether it was worth the money. The rollerball is made in Germany, and comes with a Schmidt converter inside. Rollerball on top of a B6 spiral notebook from Kakimori for scale. It came packaged with a pipette and a small plastic cup. Handy! Hard to see but there's a white wavey line and a “Kakimori”’ logo on the plastic cap. For things to do while you wait for your inks to finish at Inkstand, the obvious option would be to shop at Kakimori next door, or to take a leisurely stroll in the surrounding Kuramae neighborhood, which is what we did. There’s a green tea shop in one of the alleys called Nakamura Tea Life that we liked. We only tasted one type, so we can’t comment on the general quality of their teas but the shop itself was really charming and the owner was so cheerful and friendly. There’s also Dandelion Chocolate nearby, which at a quick glance looked similar to the original San Francisco shop/café. What’s cool about this space – just like the SF location – is that it’s also a factory where they make their chocolate in-house. We also had fun browsing Koncent, a homewares shop with a modern vibe; it had a small Sol’s Coffee stand inside the store. For more Kuramae links, please go to the bottom of my previous post here.